What will Trump’s reshaping of Interior Department mean for Utah and the West? 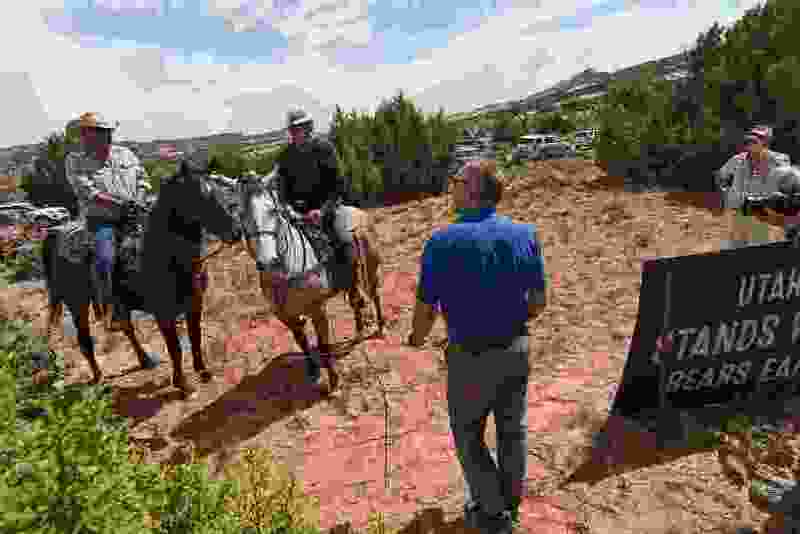 (Francisco Kjolseth | The Salt Lake Tribune) Interior Secretary Ryan Zinke speaks with Leroy Teeasyaton, left, and Willy Grayeyes of Utah Dine Bikeyah following a short hike to Butler Wash Indian Ruins by the secretary and members of the Utah delegation during a tour of the Bears Ears National Monument on Monday, May 8, 2017. The Interior Department’s various powerful land agencies — National Park Service and the Bureau of Land Management, to name two — could be consolidated into regional offices that align with the continent’s great watersheds, under sweeping plans being considered by the Trump administration. The idea, officials said, is to break down barriers between those agencies and improve coordination with state and local governments—a move welcomed by Utah leaders who have long been frustrated with federal decision-making that has profound effects on rural communities. Interior officials spelled out these and other plans Friday at a meeting of county commissioners from four Western states, assembled in Salt Lake City at Utah Gov. Gary Herbert’s Office of Economic Development. President Donald Trump’s Interior Secretary Ryan Zinke is drawn to the idea of co-locating offices for the BLM and other agencies into common “ecoregions” — such as the Northern Rockies or the Great Basin — that would split most Western states, according to Jim Cason, a Trump appointee now serving as Interior’s associate deputy secretary. Interior currently employs about 70,000 people in 2,400 office across the country. But its “stove-piped” arrangement pits Interior agencies against each other as they bounce land-use proposals between one another, Cason said. Zinke’s goal, he said, is improve “constituent services” by creating a land-management framework that is more responsive to local needs and “streamlines” decision making. Conservation groups are deeply skeptical, viewing Zinke’s initiatives as a way to clear the way for extractive industry’s use of the West’s sensitive landscapes without regard for endangered species, scenery and natural values. Utah officials in Friday’s audience, such as Kane County Commissioner Dirk Clayson, weren’t comfortable with the ecoregion concept, preferring a state-based approach. A map Cason displayed showed Utah in two different regions. The state’s northwest corner would be in the Great Basin and the rest would be in the Colorado Basin. Cason said ecoregion-based management makes sense because resources that Interior manages, such as plants, animals and water, are not organized around state lines, but around landscapes— though Zinke remains open to state-based regions, as well. Cason also hopes to locate non-Interior agencies—namely the Forest Service, Army Corps of Engineers and the Environmental Protection Agency—into Interior’s new regional offices. Zinke’s 2019 budget will include a proposal to move the BLM, Bureau of Reclamation and Fish and Wildlife Service headquarters to the West. With 312 employees, the BLM’s Washington, D.C. headquarters is the agency’s largest office. Bishop agrees the time has come to relocate Interior leadership closer to the ground where the department’s policies and work have the most impact—Western states. On Tuesday, a Utah House committee unanimously passed a resolution urging the federal government to relocate the Forest Service and BLM headquarters to Salt Lake City. But it is hard to square Utah officials’s new desire to host these agencies with significant efforts by state lawmakers to transfer ownership of federally held public lands to Utah control. That move would eliminate BLM and Forest Service holdings from within Utah’s borders, so why would the feds consider headquartering those agencies in the state? Cox said he believes that building a closer relationship between Western states and federal land agencies would alleviate the resentment driving the land-transfer movement.